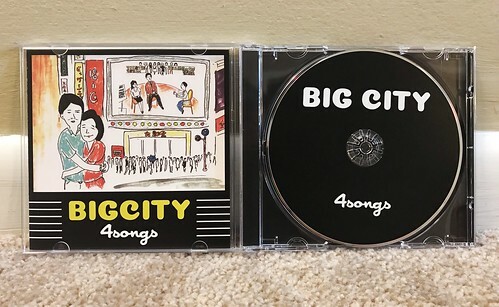 This four song CD EP is one of two CDs that I have from Big City. I will actually review the other one tomorrow, rather than hang on to it for a later date. This EP is one in a pretty big pile of Japanese punk rock CDs that I've acquired over the past two years that I haven't been able to write about. In some ways, I feel like I will have a pile like this forever, especially since Kazu is already making another pile in Japan for me to buy at some point. On their EP, Big City rushes out of the gate with a fast paced pop punk sound that makes me think of bands like The Urchin and Dillinger Four right away. They have just the right mix of powerful aggression and catchy hooks. For me that's always been one of the main reason I gravitate towards Japanese punk bands. There's just a little something extra in the energy department, I always feel like everyone in the band believes in every single note they play and every word they sing. Passion. This EP is a solid introduction to Big City. Fast and catchy is the best way to describe things. The EP is good, but the full length I'll write about tomorrow is even better.